Our crowdfunding campaign has ended, but you can still support the students of ACES In The Hole Foods by clicking here. 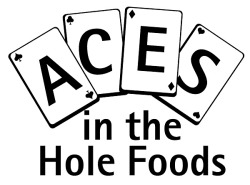 ACES in the Hole Foods is a student-run food manufacturing company in the Department of Family and Consumer Sciences, in the College of Agricultural, Consumer and Environmental Sciences at New Mexico State University. It provides students with hands-on opportunities in applying the principles of food science and technology to the production of new food products. The student-run company opened for business on October 2012 with 30 gelato and sorbet flavors combined. ACES in the Hole Foods now offers upwards of 54 flavors. ACES in the Hole Foods delivers about 1,000 gallons of gelato and sorbet a year. The revenue generated has gone to relocating into a larger production area since we were outgrowing our 200 square foot room on the 3rd floor of Gerald Thomas Hall. With the move came costs to cover small appliances and basically starting from scratch fees! Now, we are all settled in and ready to deliver. However our move left us back at square one. With hopes of paying our students for the hard work they put forth in this unique opportunity as well as expanding our customer base to local favorites such as Ándele Restaurant, La Posta, and De La Vegas, a freezer truck is the key component to make this entrepreneurship really take off. Our student-run company has demonstrated persistent growth each semester by selling to the Department of Hotel, Restaurant, and Tourism Management, Sodexo and Stan Fulton Center. All of these customers are ideal because they are located on campus. However, for the last year the ACES in the Hole Foods students have attained and held onto a relationship with Landmark Mercantile. A feed-store located 11 miles away from the campus. Deliveries to Landmark are manageable in the colder months but this summer has really pushed our limits. We have had to stuff the back seat of our Chevy truck with 20 three gallon containers of gelato and blast the air conditioner. We recently just added Lorenzo’s Restaurant to our growing list of customers. If we are to add anymore we will definitely need a delivery freezer that maintains the quality of our product. In addition to adding restaurants and retail outlets to our customer base we desperately want to serve the NMSU community. We would love to sell at football games and set up a shop at the Las Cruces Farmers market. The possibilities are endless if we have a freezer truck, we can expand our reach and business into the greater Las Cruces area. Show your support by giving up one cup of coffee and make an impact on our team of students by helping us purchase our freezer truck! Your contribution of $25 impacts our team of students and helps us purchase our freezer truck! Your contribution of $50 impacts our team of students and helps us purchase our freezer truck! Your contribution of $75 impacts our team of students and helps us purchase our freezer truck! Your contribution of $100 impacts our team of students and helps us purchase our freezer truck! Your contribution of $250 impacts our team of students and helps us purchase our freezer truck! Your contribution of $500 impacts our team of students and helps us purchase our freezer truck! Your contribution of $1,000 impacts our team of students and helps us purchase our freezer truck!